In order to evaluate heavy metals exposure risk in the mid-Cross River, the concentrations of iron (Fe), zinc (Zn), manganese (Mn), copper (Cu), lead (Pb) and chromium (Cr) in water and four commercially important fishes (Chrysichthys nigrodigitatus, Clarias anguillaris, Tilapia zillii and Mormyrus rume) were studied between February 2015 and August 2016. 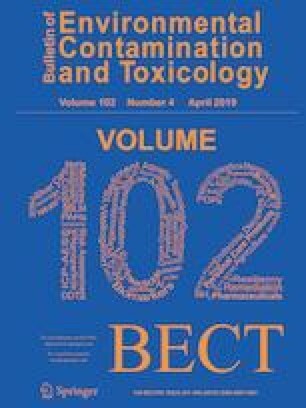 Iron (2.71 ± 0.5 mg/L), Mn (0.49 ± 0.06 mg/L), Pb (0.05 ± 0.04 mg/L) and Cr (0.06 ± 0.03 mg/L) in water were above permissible limits. The pattern of heavy metals concentration in fish was T. zillii > M. rume > C. anguillaris > C. nigrodigitatus except for Pb. The estimated daily intake of most heavy metals was below the tolerable daily intake values except Pb. Although the hazard quotient was below one, the total hazard quotient and the carcinogenic risk value for Cr were above acceptable ranges for all fishes. The online version of this article ( https://doi.org/10.1007/s00128-019-02610-4) contains supplementary material, which is available to authorized users. The authors are grateful to the Department of Applied Biology, Ebonyi State University for providing laboratory space and most of the facilities used in this study.